Software you already know: Microsoft Outlook 2010, Quicken, and Photoshop Elements. All of the benefits of Windows 7: Snap, Jump Lists, Flip 3D, Live Taskbar Previews and more. An extraordinary screen: 175-degree viewing angles on a 12.1-inch, high-definition, ultra-tough Corning Gorilla Glass screen. Free your (solid-state) hard drive: Access all your photos, movies, videos, and recorded TV on your home PC virtually anywhere with Remote Media Streaming in Windows 7 and a high-speed Internet connection. Connect your devices: Connect virtually every device—cameras, printers, Xbox, TV—right out of the box with Wi-Fi, Bluetooth, memory card slots, USB, and mini-HDMI ports. Connect your PCs: Use HomeGroup to easily share printers and access and share files, photos, music, and video on two or more PCs running Windows 7 on your home network. Get more games: Have more fun because many more games are available for PCs running Windows. And your slate PC can connect you to millions of opponents all over the world with Xbox Live and Games for Windows Live. Connect to the whole web With Windows 7 and Windows Internet Explorer 9*, you can enjoy the web even more. IE9s SmartScreen filter helps protect you from fraudulent phishing websites and malware and works with the latest web technologies to deliver superior graphics and faster, smoother animations. Share photos face to face: Video chat with Windows Live Messenger and a built-in front-facing camera and webcam that make you feel close to actually being there. And with Messenger, you can share photos with slide shows you both can see while you chat. 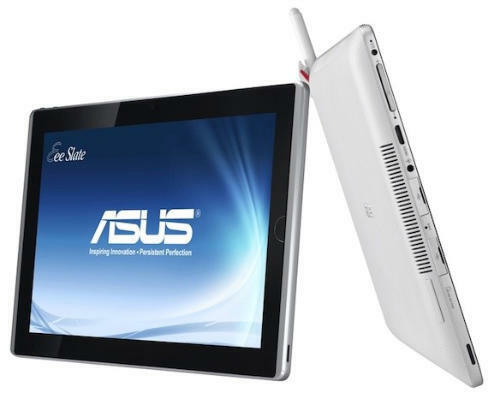 Connect with your content: The Asus Eee Slate comes with Windows Live Mesh installed, so you can keep files on it automatically synchronized with files you’ve created on any other PC running Windows 7. And you can log on to your other PCs remotely from your slate for free with just a high-speed Internet connection. See whatever’s on the web: The Asus Eee Slate includes various touch applications available on Windows Product Scout, because the Eee Slate runs Adobe Flash. 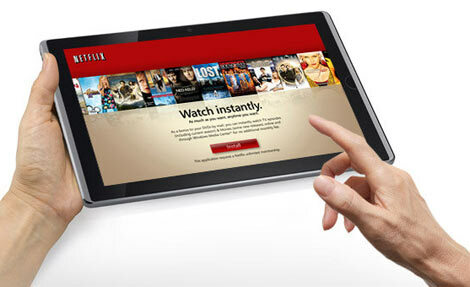 Access YouTube, Hulu, Netflix—if it’s online, it can be on your Eee Slate.